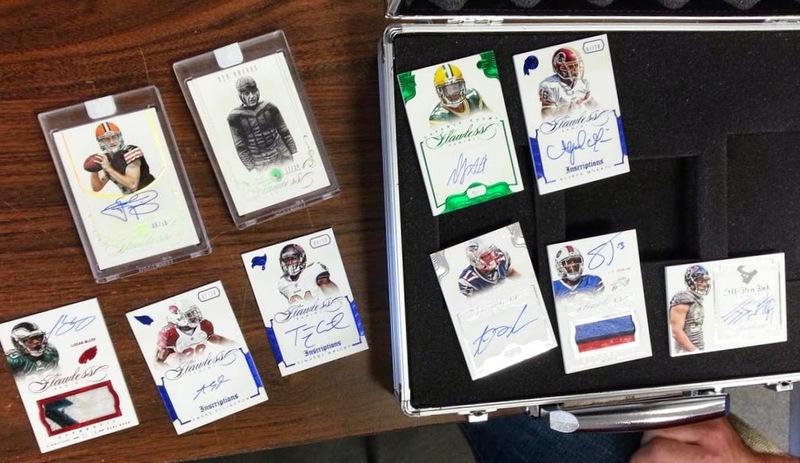 Sports Cards Plus Store Blog: 2014 FLAWLESS FOOTBALL SINGLES SIZZLE ON EBAY! 2014 FLAWLESS FOOTBALL SINGLES SIZZLE ON EBAY! Scott came in Friday to be the first to open a box of 2014 Flawless Football at Sports Cards Plus. His best hits included a Johnny Manziel Auto RC 6/10, a Red Grange base card with Diamond #d/20, a J J Watt Autographed Card #d/25, and a LeSean McCoy Auto Dirty Game Used Jumbo Patch 1/15. Here is the link to the Youtube video. After over 60 hours of eBay sales, I have revised my estimate for "Average Value per 2014 Flawless Football Box." The "Average eBay Sales" for the "Stars" was higher than I expected while the eBay Sales for rookies was lower than I expected. As the 2014 NFL Season continues, if a rookie progresses and strings together some good games that rookie's "Avg eBay Values" will go up. I've seen a $500 card pulled from a $70 box, but that is a rare exception. In 2014 Flawless Football there will be many $500 cards with $100 cards being the norm for minor stars. 2014 Flawless Football provides the highest average return of any football product to date. Here are some eBay sales from the weekend followed by an analysis of "box value." UPDATE: As of 10:45 a.m. Wednesday, November 5th, 803 Flawless Football singles have SOLD on eBay. 229 cards (28.5%) sold under $41; 213 cards (17.2%) sold for $41 to $74; 94 cards (11.7%) sold for $75 to $99; 183 cards (22.8%) sold for $100 to $199; and 126 cards (15.7%) sold for over $200. That is 38.5% sold for over $100 each. On the Average you will get four cards worth from $100 to $1650 each.